Marquette Catholic High School students have the opportunity to develop spiritually. Whether through Theology courses, school Masses, service experiences and Kairos, or just stopping in our Chapel for a quick prayer, Marquette offers students four years of opportunity to further their relationship with God while learning values they will carry throughout their lifetime. Marquette Catholic High School graduates go on to attend some of the finest universities in the country. 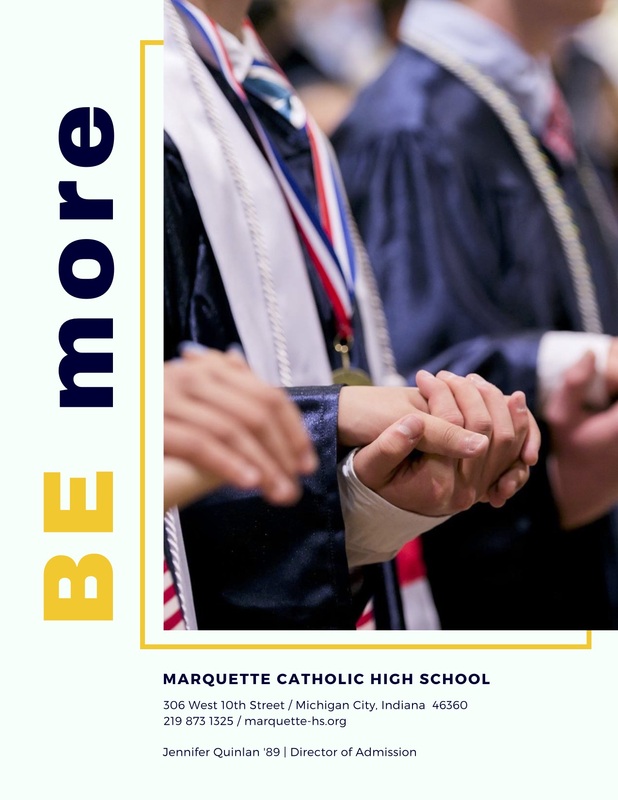 With SAT and ACT scores ranked in the top 15% nationally, academic teams who annually place higher than most teams in the region, and AP scores above the national average, Marquette's academic opportunities are second-to-none. The most powerful tools for learning are the ones students love to use at Marquette and an Apple iPad has been placed into the hands of every student. No more paper. No more books. Everything is at your fingertips. MQTT-U supports all students in developing a personal relationship with Jesus Christ and working for the Common Good. MQTT-U ensures success - not simply acceptance - into the post-secondary education. MQTT-U affords all students an honors curriculum which provides knowledge and understanding of our global world and 21st Century learning and skills through experiential, integrated, and relevant learning strategies. The program includes job shadow experience, project-based learning, a 1:1 technology platform (iPad), study abroad, global travel experiences, and service opportunities. The program design is sometimes referred to as an "early college high school." Students who successfully complete this program will graduate from Marquette with an academic honors diploma and an associate degree. Marquette takes great pride in its winning athletic tradition. Our student-athletes often play against the best competition in the area and regularly advance deep into the IHSAA Tournament, creating memories that will last a lifetime. We own 11 state championships (and counting), have made multiple state finals appearances, and have won dozens and dozens of sectional and regional championships. Every year, many of our graduating student-athletes go on to compete collegiately across the country. In his best-selling book "The World is Flat", Thomas Friedman argues that globalization has changed the way in which we view the world. A reality of life in the 21st Century is we are now connected - almost on a daily basis - with people from all over the world. As a response to our living in an increasingly global society, Marquette encourages students to gain a heightened awareness and understanding of diverse languages, cultures, and new developments related to globalization. Study abroad for a semester, participate in a cultural immersion or take part in a global summit - from any of the opportunities, you will gain an experience of a lifetime. Marquette takes pride in finding a way to make sure any student who wishes to attend Marquette, can. We make every effort to make a Catholic education affordable to students by allocating funds for need-based tuition assistance. Financial assistance comes from four sources: the Diocese of Gary, the Marquette Foundation, Marquette Catholic High School, and private donors. So you have been with the same classmates for the last eight year and are ready to make some new friends? With students from 15 different schools throughout Northwest Indiana and 12 different countries, Marquette offers you a great opportunity to retain current friends and meet new ones - all on a campus where everyone knows your name. A Marquette education pays for itself - more than three times over! On average, our graduating seniors earn more than $100,000 per student in college scholarships. That's more than triple the full cost of four years of Marquette tuition. Whether you are drawn to the visual arts or performing arts (or both), Marquette has something for everyone. Design that special art piece for the student art exhibition gallery, or take the lead in one of the school's musical performance or plays! Learn the techniques of the behind-the-scenes importance of sound, lighting, make-up, or scenery - or sing in the MQTT Chorus! Many Marquette students have gone on to pursue their passion for the arts at some of the finest art schools in the country. At Marquette, there is something for everyone and there is something especially for you!